*** NEW in 2018... In order to apply for a parking pass, students must show proof of their electronic registration. NO parking permits will be sold to a student who has not completed the electronic registration. Electronic registration is taking the place of the multi-paged packet students usually bring home for parent view/signatures. If a family does not have access to a computer/internet/printer, they are welcome to come to the High School to complete the electronic registration. Students who are eligible to drive on campus may save time by printing and completing the parking permit request form and the drug testing consent form. A parent or guardian must sign both forms. Students must also bring a copy of their insurance and their valid Texas driver's license. 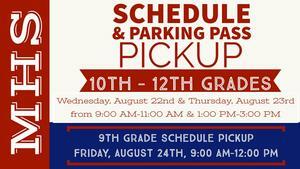 Parking permits will be sold throughout the school year. Students must always display their parking tag and park in their assigned spot. If you have questions regarding student parking, please contact Dr. Golden.